New Delhi, Jan 26: Dr. Ram Puniyani and Setu Charitable Trust have been selected for the National Communal Harmony Award for the year 2007. The jury, headed by the Vice-President of India, M. Hamid Ansari, selected Dr. Ram Puniyani in the individual category and Mumbai based Setu Charitable Trust for the organization category. Dr. Ram Puniyani, a former Professor at IIT, Mumbai has been spreading the message of peace and amity through lectures, publications, workshops and meetings and by travelling extensively to different parts of the country disseminating messages of secularism, pluralism and communal harmony. Setu Charitable Trust, Mumbai was established in the year 1994 and is engaged in the rehabilitation of riot victims and their families and more specially, children orphaned by communal, caste and terrorist violence in Mumbai and in other parts of the country. The work of the Setu Charitable Trust in the field of community development, mobilization and awareness building among the deprived sections of the society, such as, poor women and underprivileged children living in urban slums and rural areas, and rehabilitation of sexually exploited women in Parbhani is well-known. 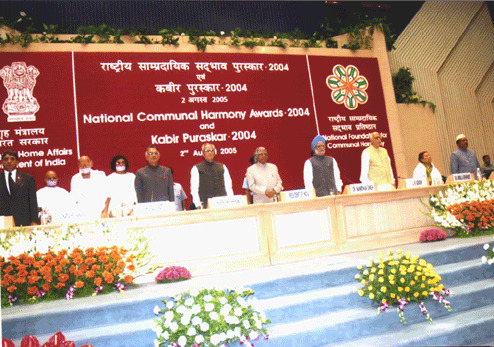 The National Communal Harmony Awards were instituted in 1996 by the National Foundation for Communal Harmony (NFCH), an autonomous organization set up by Government of India and Ministry of Home Affairs, for promoting communal harmony and national integration. The award has been instituted with a view to demonstrating due appreciation and recognition by the Union Government of the efforts of individuals, organizations and institutions or promotion of communal harmony and national integration in a sustained manner over a sufficiently long period of time.